The Rebel Sweetheart. 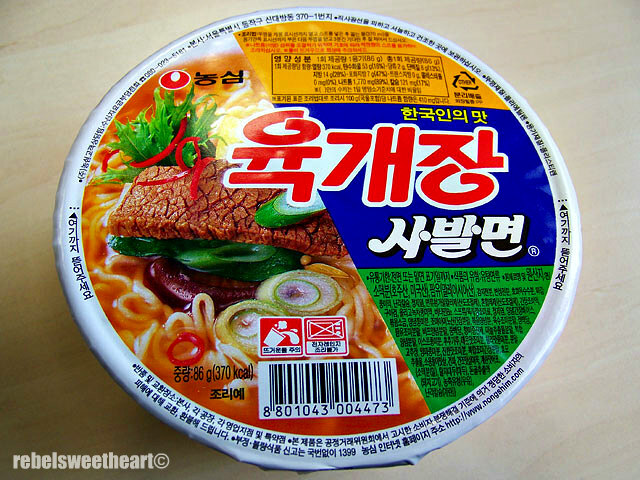 : Foodie Goodie | Korean Ramyeon. They say in Rome, you must do as the Romans do. Hence, in Korea, you must eat like the Koreans do. And no, I'm not talking about good ol' kimchi. I'm talking about ramyeon - those flavor-packed instant noodles, which is actually like kimchi to Koreans. They love it, they thrive on it, and they've even earned a world record for it; South Korea, in fact, ranks number 1 in the world for ramen intake. They love their ramyeon so much that some would even say they are on a 'noodle diet'. While I have no plans of becoming a ramyeon addict myself, I do eat ramyeon occasionally and have enjoyed some of the brands/variants that I've tried. I used to have very low tolerance for spicy food, but after marrying a man who cooks the most awesome Bicol Express (spicy pork stew made with coconut milk and chilies), and after visiting Korea twice within a span of six months, I guess my spice tolerance has amped up by a bit. Nongshim Hearty Beef Rice Noodle Soup. Like I've mentioned, my taste buds can not handle spice very well. I chanced upon this ramyeon at SM Supermarket and seeing how it's the only variant that isn't black or red in color (an indicator of spice), and has no pictures of chilies on it, I decided to buy a cup and give it a try. 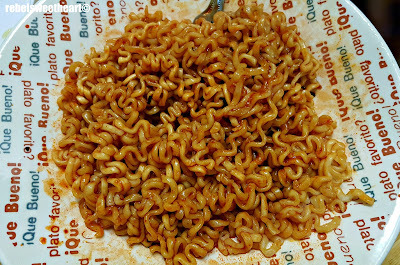 True enough, this ramyeon isn't spicy at all! The broth is very flavorful, the kind that you would want to sip on a cold, rainy night. It also has a creamy color, and a nice beefy taste. The rice noodles are pretty good, too - not overly chewy with good texture and consistency. If you have very little tolerance for spicy food but want to get acquainted with Korean (noodle) flavors, this brand is a great choice to begin with. 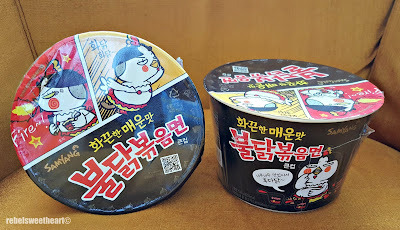 This is one of my husband's favorite ramyeon brands, mostly because they get to enjoy bowls of these at work, for free. (Their boss leaves boxes of these for them to eat as snacks, lol.) My husband brought home a bowl one time, and guess who enjoyed it just as much? 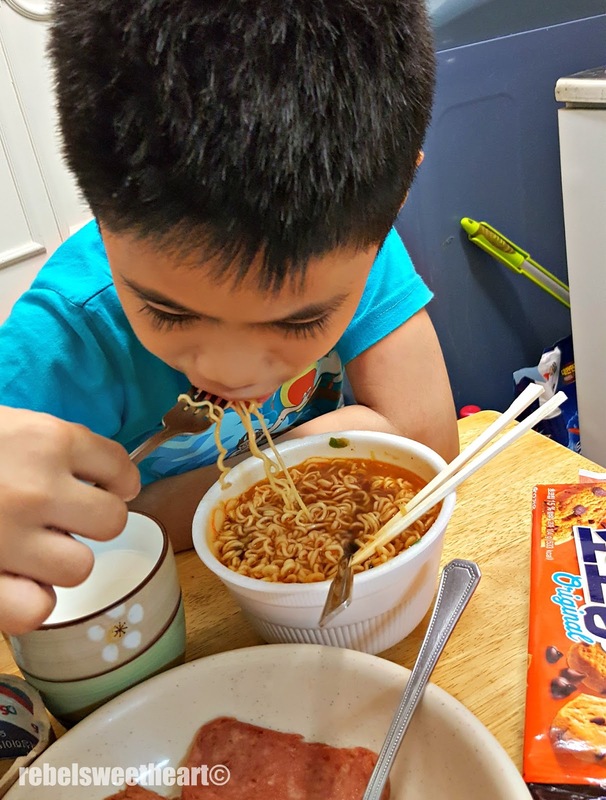 The boy now has a thing for ramyeon. He likes to eat it with cheese. Yup, he did, surprisingly. I was initially worried that he might not be able to stand the spice, but he did! This ramyeon has decent heat, but nothing a kid couldn't handle. (Yue likes to eat this ramyeon with slices of cheese in it.) The noodles are pretty good, too. It also has several pieces of narutomaki in it (you know, that spiral symbol on Naruto's headgear), which was quite nice to look at and made this ramyeon even more fun to eat. 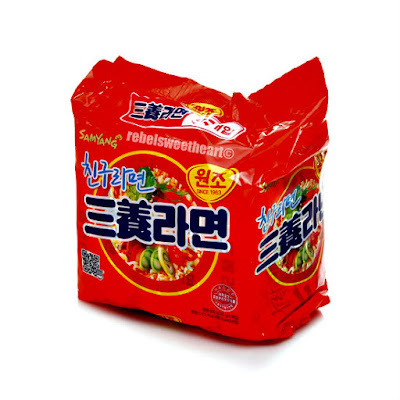 Dubbed as 'the grandfather of ramyeon', this was the very first product of Samyang Foods and was introduced to the market in 1963. Its first version tasted more like chicken soup, and was made to suit Japanese taste, which was light. Eventually, Samyang changed the seasoning to make it taste like beef and adjusted the flavor to Korean preference - deep, rich, and spicy. This ramyeon has tolerable spice, as opposed to its 'Hot Beef' counterpart. The broth is rich and tasty, and the noodles are plump and flavorful. It also contains a nice assortment of vegetables, which re-hydrate nicely when cooked. 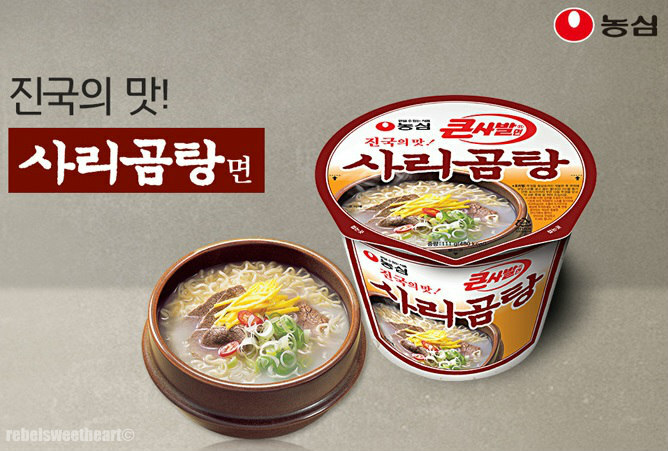 Fusion food has become so popular that even instant noodle manufacturers have followed suit. This Chapagetti from Nongshim is a fusion of spaghetti and the black bean paste called 'chajang' (or 'jjajang'). Originally from China, this black bean paste first started appearing in Korea’s port city of Incheon in the 19th century as the city’s Chinese immigrant population grew. 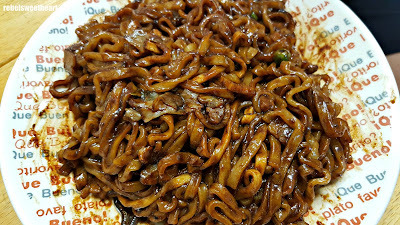 The immigrants, mostly from China’s Shandong Province, brought along their traditional cuisine, and among these, Jjajangmyun became extremely popular in Korea. Through time, this dish has evolved to suit the taste of Koreans and has become part of the Korean food culture. Much like the real jjajangmyun, Nongshim Chapagetti has thick, chubby, chewy noodles, The sauce has a nice consistency and a hint of sweetness. None of the bitter aftertaste, which is my husband's gripe with other instant jjajang brands. Each pack of the Nongshim Chapagetti also comes with a decent amount of vegetables (carrots, green peas, onions, dried potatoes) for garnishing. 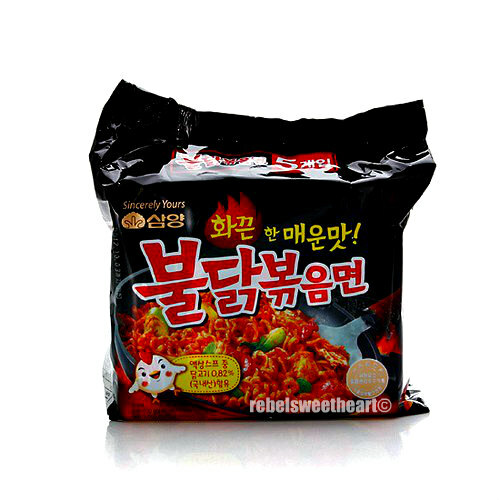 Samyang Hot Fried Chicken Ramyeon. A friend of mine asked me to bring home some of these for her after seeing videos of 'Samyang Challenge' on YouTube. I was curious as to what this fuss is all about. so I asked my husband to buy a pack so I can try it for myself. He was quite hesitant in buying this for me, as he knows I can't handle spicy food very well. He even asked me several times before preparing the noodles, making sure that I knew exactly what I was doing. 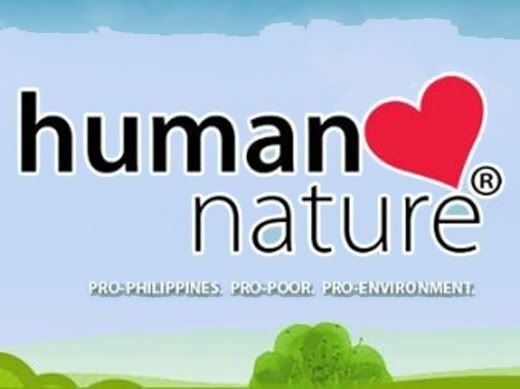 Apparently, he has tried this brand before and has an idea of how nasty things could get. Once prepared, the smell of the sauce alone (one sniff and you'll know this is gonna be one hell of a spicy ride) made me gulp in fear. Haha! But I tried it anyway, and oh my freaking gawd, it was extremely, over-the-top spicy!!! I did enjoy its nice chicken taste and the thick and chewy noodles, but I can not focus on these because of the burning sensation slowly creeping on my tongue. I was sweating like crazy after a forkful, and had to down a glass of chocolate milk before taking another bite. On my second forkful I could feel the heat literally coming out of my head, and my eyes were starting to water. By the third forkful (because I did not want such good food to go to waste), the heat was all over my mouth and I could feel my throat burning. I gave up after that, and let my husband finish the rest of it. Haha! They also come in bowls. Brought home a few for my siblings to try. I don't think I'll eat this again (unless they come up with a milder version) but the experience was worth it. It's great to come out of your comfort zone and experience pain every once in awhile. Haha! These are all awesome. My go-to food will always be instant noodles, but they have to be spicy. I'm really curious about all of these! Thanks for sharing your experience with them! Korean Ramyeon looks delicious. Kids will surely love the taste of it. I'm so excited to try this as well as my nephew, he wants to try this. I love to try all of these, I am used to our local instant noodles but I will definitely love to try Korean noodles. I've been looking for Chapagetti since forever! Where did you get yours? I have tried only the American version, but I like it. The hot & spicy is my fave, but it's harder to find than the others.